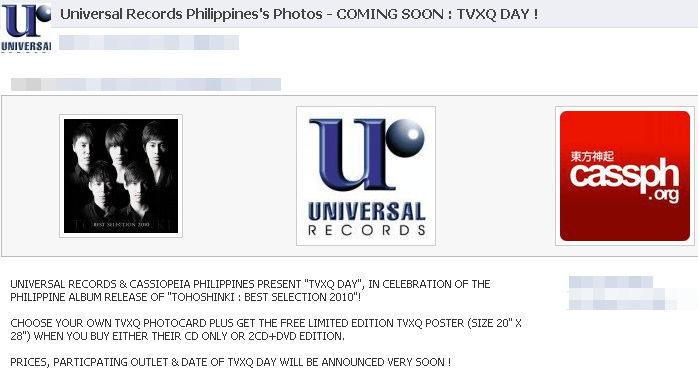 [TRANS] 100314 TVXQ Album Dominates Korea! Cassiopeia’s Hot Support Continues On! They broke the record set by U.S.A. rock group Bon Jovi’s “Three Days” which was sold 379,000 in 1995.
the music history in Japan. 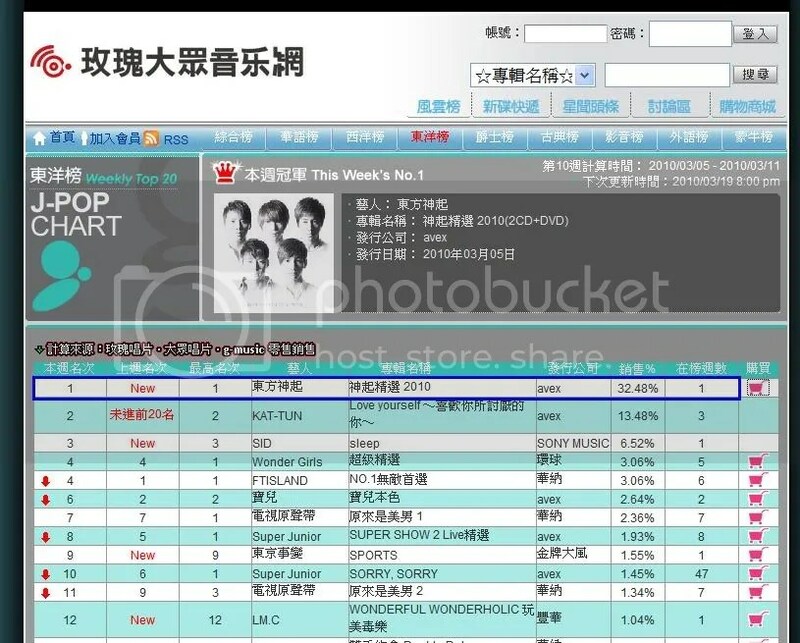 TVXQ’s hot popularity in Japan. 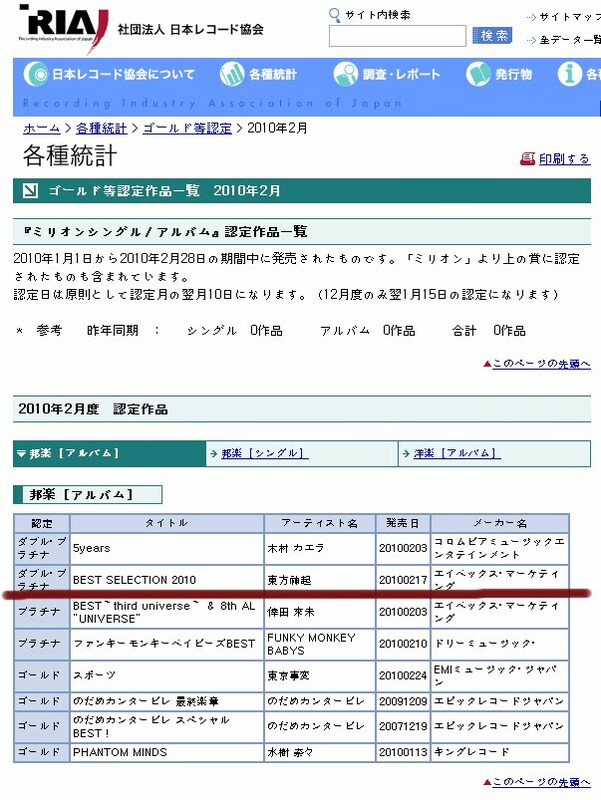 The figures from the RIAJ has been recently updated, and Tohoshinki’s “BEST SELECTION 2010” has achieved the ‘double platinum’ status. [TRANS] 100309 First Time Ever! Exceeded 500K! 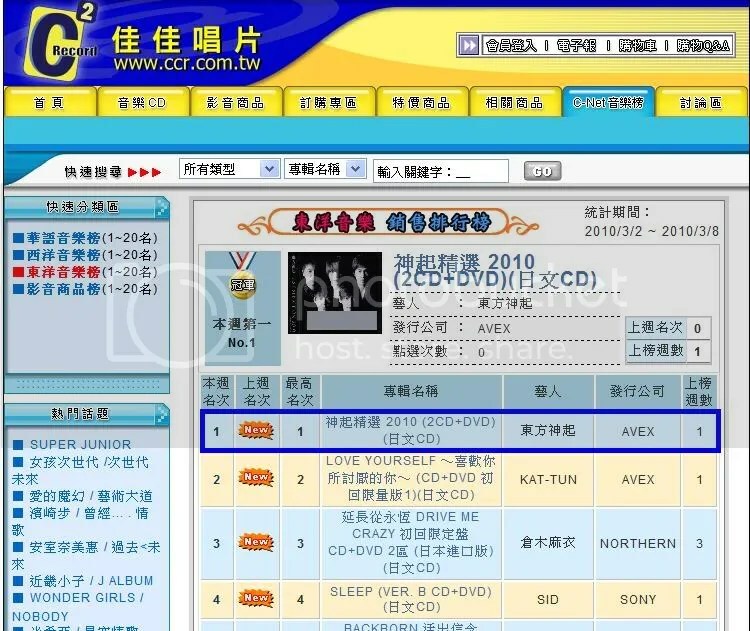 TVXQ Album: “Best Selection 2010” 503,761 Pieces Sold! 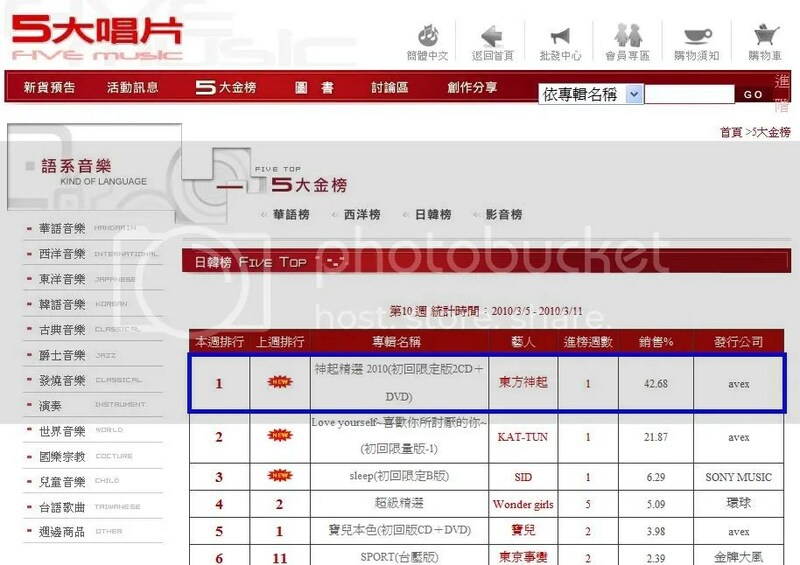 recorded 503,761 pieces of sale number. after an interval of five years activities in Japan. week and in a month at Oricon Ranking. men and women who got to know each other through twitter. talked about his enthusiasm toward an upcoming drama. is working hard with his Japanese training and also his acting skill intensively. drama not to mention Japanese fans. Q: It’s been 5 years since you debuted in Japan. When everyone debuted, you were only slightly older than 20 years old, but now you are all adults. 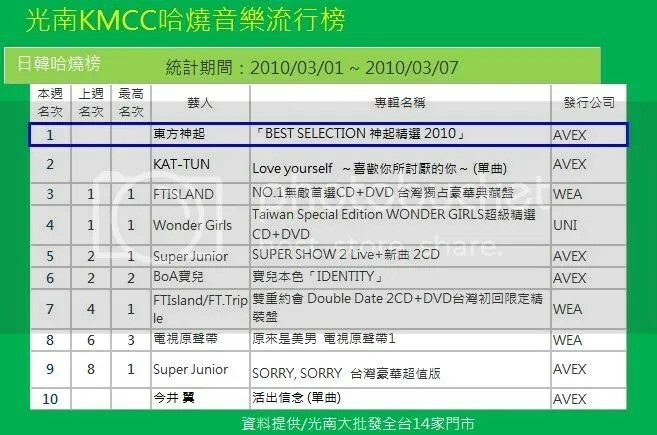 Now, the anticipated Best Selection 2010 is finally being released, could you each please talk about your heart’s “BEST OF BEST” song? JS: I think it is Mirotic. Looking at it from the style aspect, this is a song that challenges one in many ways, looking at it from the results aspect, this is a song that matches TVXQ’s image well. 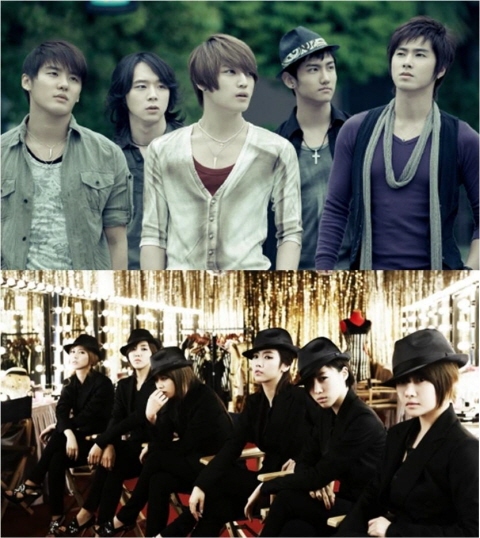 Powerful & charismatic, many people regard this song as the most TVXQ-like song. Q: Then, even though you yourself may not think it is the best, but if you had to choose a song for your loved one, what song would you choose? Q: Reminscing all the songs you’ve released till now, on the whole, what overall impression should it give? 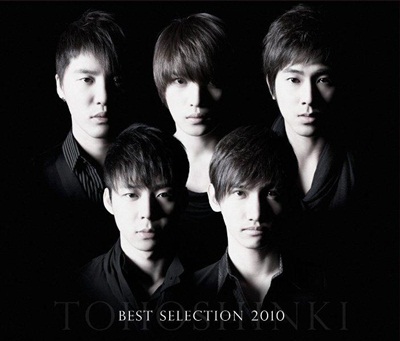 Your thoughts when Best Selection 2010 was released should have been different from how you felt when you released normal albums..
JS: Mmhmm, when releasing Best Selection, we made a concerted effort to choose the best songs, these should also be what many people want to hear. For this point, I am very happy. Q: Everyone has improved in various aspects along with the songs. So from now on, we will enter the segment on “Being Manly Celebrities”. Firstly, what kind of person do each of you think you are? Please state some good and bad points. JS: I have no good points ^^. Let’s just put it this way, I don’t think I have any. Others think it is my decision-making capability.. I basically belong to the category of people with positive personality, if it’s not meant to be, I will definitely give up. Flaws.. there seem to be none too. Just kidding. There’s a lot. One of them is that I really hate losing, even if it’s just a minor loss, I won’t admit it. Recently, however, I’ve matured slightly and will not be so immature. However, in men, hating to lose isn’t really a bad point!? Q: Then what type are each of you when it comes to facing love? JS: For me, two people are all. There must be enjoyment, as well as calmness, considering both parties. I myself, when in love, will undergo a major emotional change, I don’t know what it will be like in the future. So, it’s best not to think too much, Nature will lead the way. Q: How do others want to protect girls? JS: (If during a date, they meet gangsters) I will carry my girlfriend and run away! I will run away at full speed, I have full confidence at being able to escape! Q: So direct and so reliable. So in the end, what kind of man do you want to become? Please share with us your goals. YC: I want to become a tactful person. In this way, I will be clear about what I myself want. JS: Me too. I want to be tactful towards all things. I want to become a man who can take care of others. Other than that, if I can continue singing in the future, I’d be content.